1. Preheat the oven to 220ºC, gas mark 7. Cook the potatoes in a large pan of boiling water for 10–12 minutes until tender, then drain well. 2. Meanwhile, mix together the tandoori paste and 100g of the yogurt. Spread the mixture all over the salmon then place on a parchment lined baking sheet with the tomato vines. Bake for 12-15 minutes until the salmon is cooked through. 3. Mash the potatoes until smooth then beat in the remaining yogurt and chives. 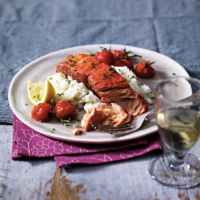 Divide between 4 plates and serve with the tandoori salmon, roasted tomatoes and lemon wedges.